The financial services industry is under the microscope in Australia with the Royal Commission in full swing, and the recent APRA (Australian Prudential Regulatory Authority) report into the CBA (Commonwealth Bank of Australia). Many sobering findings have been aired, but looking at this positively, the findings provide an excellent blueprint for the development of stronger risk management and business practices going forward. The APRA report is really a roadmap for any organisation wishing to raise its risk management to the next level. One of many concepts of the APRA report is the “Voices”. Particularly mentioned are the Voice of Finance, The Voice of Customer and the Voice of Risk. It calls quite rightly that for an appropriate balance between them all rather than anyone being dominant. Typically, in the financial services industry, the voice of finance has been the loudest to the detriment of customer and risk. Read the Toyota Financial Services Case Study. I plan to progressively write a few blogs on the excellent guidance provided by APRA. In the interim, however, is a word of warning. There is always a risk that where the Voice of Risk has not been heard for some time, when we do hear and respond to it we then ignore the voice of “Reward”. This can produce a “knee-jerk” reaction where we imbalance the voices again but this time ignore the voice of reward. We then find ourselves very well risk managed but performing poorly. We must resist this and ensure the balance between the voices is always maintained equally both in good and bad times. 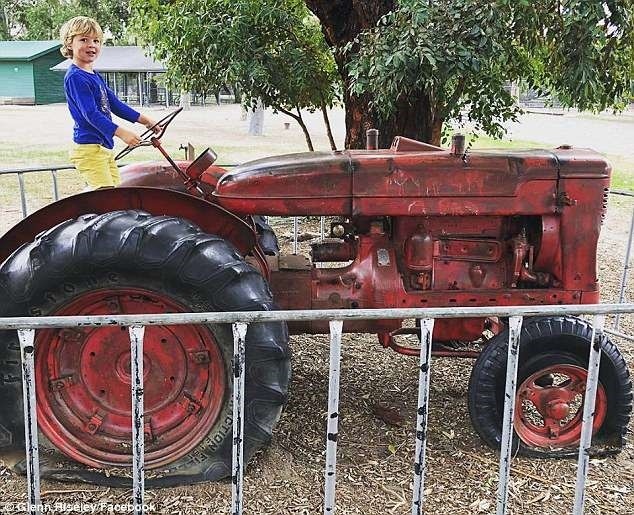 It is a picture of a school play area in Victoria, Australia (Elsternwick Primary School), where a fence has been erected around the tractor as the school has banned children playing on the tractor as it was deemed 'too dangerous' and posed a health and safety risk to children. A father, Glenn Riseley, protested by posting a picture of his son playing on the tractor to Facebook. Is this an example of where the voice of risk is too dominant, and the voice of customer (child and parent), and the voice of reward is not being heard. When you finish the article, remember to watch the webinar recording: Balancing Risk and Reward. What are the voices we should be listening too? It seems in this case, that the voice of Risk from the school and authorities is the only one being heard and that the voice of Reward and the Child/Parent has been hushed. We need to move to a position where the voices of reward and risk are equally balanced and the voices of the service provider ”school and authorities” are equally balanced with the voice of the customer “Child and Parent”. We often hear the term “cotton wool parenting” where risk is the dominant voice. This leads to children who leave the nest with little idea of how to balance risk and reward which does not set them up well for a fruitful life in society. How do we encourage and manage the various voices so as to be fairly balanced in our business lives? All too often, we see Board and Management reports which focus on only one of the voices at a time. The voice of internal reward (usually financial voice) is the longest report and the one which has most time spent on it. The voice of customer reward is then shown separately, usually a much shorter report focusing on aggregate customer satisfaction/net promoter scores. The voice of internal risk is then tabled in a separate much shorter and filtered report and, finally, the voice of external risk arrives last. Reporting needs to table the voices together so that the balance can be understood and the quantity of data, and therefore focus, of each voice should be similar. The following is an example report showing the voices of risk and reward from all relevant stakeholders. This shows us that the voice of shareholder and employees are the strongest and customer, regulator and suppliers the weakest. It also shows the voice of reward (KPIs), is stronger or favoured compared to the voice of risk (KPIs). Read article: How do Key Risk Indicators work? This highlights that risk and reward information across the various stakeholders should not be viewed in isolation but instead be brought together to provide a balanced snapshot of all the things that matter. Does your risk system allow you to collect and report on KPIs as well as KRIs? 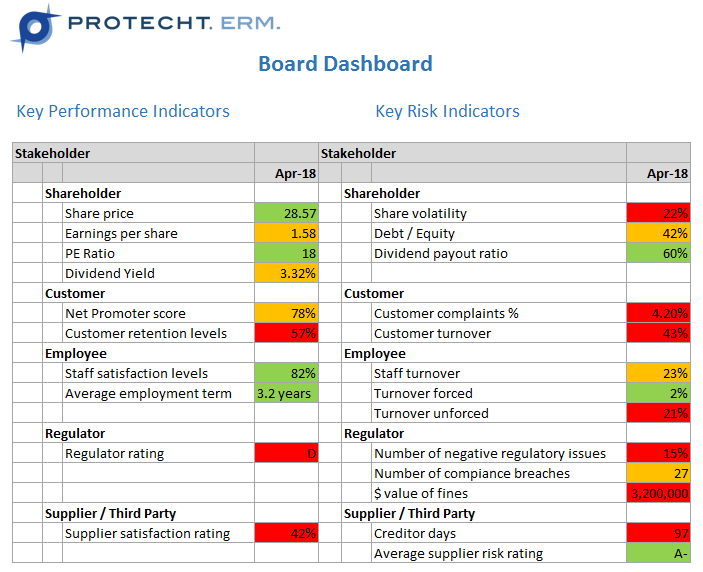 Does your risk system allow you to produce consolidated dashboards with your KPIs and KRIs brought together? Are your remuneration and incentive schemes based on this balanced view of performance and not on the “Sales Person of the year award”? Do you have appropriate risk-reward decision making practices and ability to document these decisions and have them challenged? The focus is solely on the voice of the school and authorities and solely favouring risk. Reward has been forgotten and so has the voice of the child and parent. It is hard to see how this is the optimal decision in this situation! Would you like to explore these concepts further? Join our public training courses, especially our Risk-Reward Decision-Making training course. Explore the courses here. Book a demonstration of the Protecht.ERM system to see how risk and reward can be systemised.